Dr. Mary Ann McGarry will be giving several talks about the Plymouth State University Forest to Forest Bicknell’s Thrush Cluster Project this fall. She will be speaking at the Appalachian Mountain Club’s Joe Dodge Lodge in Pinkham’s Notch, NH on August 19th and September 29th at 8:00 p.m. A similar presentation will be hosted by Squam Lakes Association, Holderness, NH on October 10th. 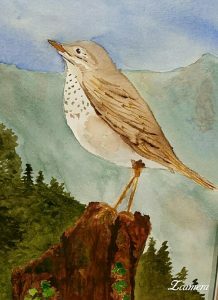 The project introduces a rare bird, that spends summers in the high peaks of New Hampshire, as a catalyst for thinking about sustainable development in the Northeastern U.S. and Canada, and the Caribbean, where the bird migrates to its winter habitat. Maps, paintings, posters, poems, and writings created by project participants of all ages from New Hampshire as well as the Dominican Republic will be showcased. Innovative conservation initiatives designed to make a difference will be shared.